I am enchanted by Persian and Moroccan cuisine. I had an opportunity to make friends a Persian and Moroccan feast a while back. I'm lucky to have a Persian grocer within a half hour of my home where I can buy all the special ingredients I need. I prepared four appetizers for our dinner, Eggplant Slices (from the cookbook Arabesque) , Yogurt and Cucumber with Persian spices, Zucchini Fritters (Arabesque) and this Cheese and Walnut Dip from the cookbook New Food of Life by Najmieh Batmanglij. 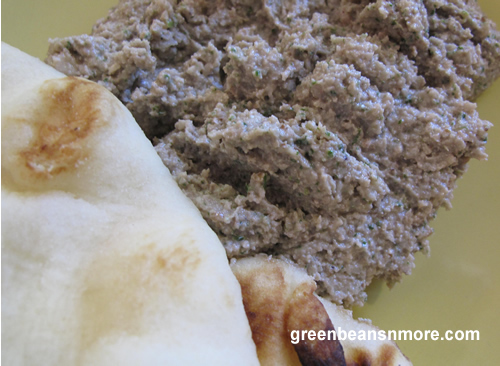 This was a most delicious dip with a most unusual flavor from the paneer and walnuts. As with most foods, it's best after it sits a few days and the flavors have a chance to develop. This is a very thick dip best served at room temperature. Please read my "cook's tip" following the recipe. In a food processor or in a bowl, mix the cheese, chopped walnuts, scallions, fresh herbs and garlic. Cook's tip: This is a simple recipe that comes together quickly, however, you need a food processor in order to get the proper consistency of the cheese and walnuts. I would NOT recommend trying this recipe if you don't own a food processor.